The input stage of the Stereomour II consists of a pair of 12AT7 tubes. One half of the 12AT7 is configured as an actively loaded voltage amplifier using our Camille Cascode Constant Current Source for super quiet, dynamic, linear performance. It is RC coupled to the output stage with a high quality film capacitor. The output stage uses a 2A3 tube and cathode bias. A plate choke loads the output tube and the output is via a high quality parallel feed coupling capacitor and parallel feed output transformer configurable to 4,8 and 16 ohm settings to work with a broad range of speakers. The amp uses zero global negative feedback. The unused halves of the 12AT7s will accomodate future upgrades. We have several cool upgrades for this kit coming down the pike. A custom Bottlehead universal 110/120/220/230/240VAC power transformer supplies high voltage to the driver stage C4S load and output stage plate choke via smooth sounding ultrafast rectifiers and a conservatively designed dual mono CRCRC filter for quiet operation. The power supply components are point to point wired in such a manner as to allow for more cool future upgrades. The chassis layout utilizes a 10″ x 12″ format. The random brushed laser cut aluminum plate is extra thick to accommodate the ample iron. The chassis plate sits in an attractive Pacific Northwest alder wood base that you assemble and finish to taste. Inputs, speaker binding posts and an IEC style power entry jack are at the top rear of the chassis plate. A easily accessible power switch sits at the top front of the chassis along with volume, balance and input selector controls, and equally easy to access hum balance pots resides next to each output tube. Laser cut chassis plates and alder wood base kits are made for us here in the Pacific Northwest. Our custom Bottlehead power and output transformers and plate chokes come from Northern California. The new for Stereomour II universal power transformer has been designed by Bottlehead’s head of R&D, Paul Joppa. Rectifiers are ultrafast soft start types. Capacitors are a combination of polypropylene and low ESR electrolytic. Resistor compositions are carefully selected based on the requirements of the circuit, and all resistors are sized for conservative power dissipation. Hookup wire includes both Alpha teflon and Carolco insulated 22 ga. solid core copper wire for high voltage connections and shielded/solid core Cat-5 cable for easy to install, super quiet signal wiring. You bet! We know how much pleasure Bottleheads get from modifying their gear, and we have several cool upgrades in development for future release. Input impedance is 50K ohms, output can be configured for 2,4,8, or 16 ohm speakers. We recommend speakers of 96+dB sensitivity for serious listening with all kinds of music. 93 db speakers are satisfactory for less stringent requirements (chamber music, soft jazz, acoustical) and smaller rooms, and Doc even uses Stereomour prototypes in his home theater with some 87 dB sensitivity monitors with very satisfying results. Sonics are hard to describe in print – suffice it to say that Stereomour sounds like the very good SE2A3 amp it is, and our customers have remained enthusiastic about the Paramour/Steremour design amp for over 15 years now. The parafeed output and C4S active load give the amp a remarkable sense of realism, bandwidth and bass articulation, particularly considering the price. So what else makes Stereomour II different than Stereomour? 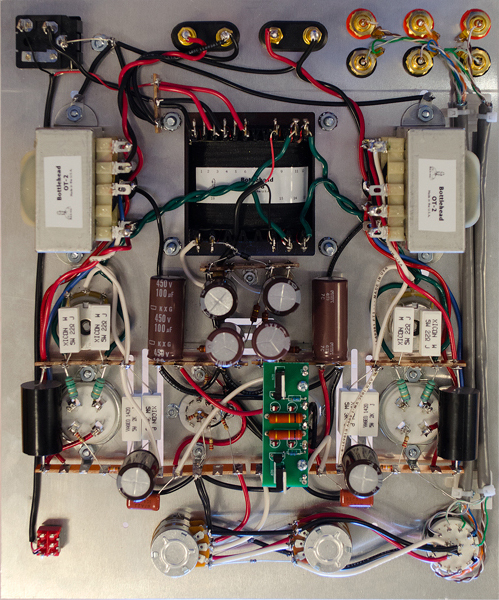 There is the addition of a balance control pot (and the associated parts to make that work), along with an extra RC high voltage power supply filter per channel. The Stereomour II also has gone to dual 9 pin sockets and additional terminal strips to allow for several future upgrades that we have planned. These upgrades will make it possible to approach our top line 300B amp in sonic quality. Yes, a beginner can build it! This kit was designed from the get-go as an introduction to the wonders of DIY audio and single ended sound. Construction is just plain easy. All the builder needs to supply is solder. We’ve a reputation for the best assembly manuals in the business. A very thorough assembly manual Adobe PDF format is available for download with your kit order. It contains step by step instructions you check off as you go, detailed photographs of the assembly that can be blown up for great detail, and a detailed checkout procedure, along with tips on tool selection. bottlehead forum, an online forum where fellow bottleheads will answer your construction and troubleshooting questions. You’ll need a 30-40 watt soldering iron (solder stations rule!) and some solder, a volt-ohmmeter, some simple hand tools like a screwdriver, pliers, and a wire stripper, and some glue, sandpaper and your favorite finish for the wood base.